What were some of the smallest and largest dinosaurs known in the Jurassic period? Some of the dinosaurs living during the Jurassic period evolved into the largest creatures ever to live on land—with the majority being plant eaters. And it seems as if every year brings a new fossil discovery that unearths another, larger dinosaur. 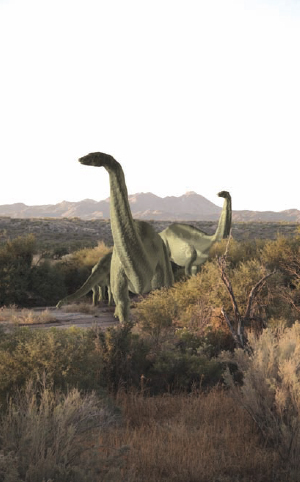 The largest complete dinosaur so far discovered is the Brachiosaurus, which measured 75 feet (23 meters) in length and 46 feet (14 meters) in height, or about the height of a four-story building. But this Jurassic dinosaur has yet to win the ultimate “big” prize. The reason for this hesitation in giving the Brachiosaurus the “largest” status is familiar in dinosaur studies: there are too few skeletal remains of larger dinosaur species, with only fragmentary leg bones and vertebrae. This makes determining the size of these dinosaur species difficult. For example, many fragments point to such possible larger dinosaurs as the Argentinasaurus and Amphicoelias, both of which may have been one and a half to two times larger than Brachiosaurus. The two longest dinosaurs in the Jurassic period may have been the plant eaters, the sauropods Diplodocus and Supersaurus. The Diplodocus measured more than 90 feet (27 meters) in length; the Supersaurus, thought to be a major contender as the longest land animal ever on Earth, measured close to 138 feet (42 meters) long and 54 feet (16.5 meters) tall. At one time, scientists believed that these huge creatures had to live in the water to support their great bulk; but the latest research suggests that the dinosaurs were able to carry their weight on land. The smallest Jurassic dinosaurs, called the Compsognathus (“pretty jaw”), were just slightly larger than a chicken. This dinosaur was 3 feet (1 meter) long and probably weighed about 6.5 pounds (2.9 kilograms). Larger carnivorous dinosaurs included the Allosaurus, which measured about 50 feet (15 meters) in length. Scientists believe the attack of the Allosaurus was amazing: it would open its mouth to the furthest extent, running headlong into its victim. Its 60 curved, dagger-like teeth would plunge into its prey, driven by two tons of dinosaur. Once commonly referred to as the Brontosaurus, this long-necked sauropod is now more correctly referred to as the Apatosaurus (iStock).